Two wind energy items arrived in my inbox in close proximity recently. One was from the NZ Wind Energy Association (NZWEA) congratulating Meridian Energy on turning the first sod at Mill Creek wind farm in the Ohariu Valley north-west of Wellington. It’s a 60 megawatt farm of 26 turbines. The project will cost $169 million and is expected to be commissioned by mid-2014. It will increase NZ’s installed wind capacity from 623 megawatts to 683 megawatts. NZWEA’s chief executive made appropriate remarks to accompany the announcement, reiterating the expectation that at least 20% of NZ’s electricity will be generated from wind by 2030 and noting the technology advances in harnessing wind which is now one of the lowest cost options for new generation in New Zealand. It’s good to see the steady progress in the development of wind energy in NZ, although it seems to arouse little excitement in Government circles who reserve most of their interest for further fossil fuel development. And a report in Saturday’s NZ Herald was a sobering reminder that the $7 billion invested in the oil and gas sector over the past five years puts it far ahead of any other local sector when it comes to investment in new productive capacity. NZ is hardly on the brink of transition from fossil fuels, hardly, it seems, even interested in the possibility while there’s money to be made from exploiting them. 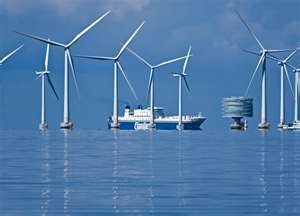 The second item was from the Earth Policy Institute (EPI), and reported that offshore wind development is picking up pace. Globally wind power now has 238,000 megawatts of capacity installed. Most of that is land-based, but the focus of the article was on the rise in offshore wind capacity, which has expanded nearly six-fold since 2006 to currently stand at 4600 megawatts. The article provides a useful overview of the prospective future development. More than 90% of the offshore wind installations are in Europe, where the UK leads the way with 2500 MW, over half the world total. Outside Europe, only China and Japan have operational offshore wind farms. Although its first offshore project was not installed until 2010, China already ranks fourth behind the United Kingdom, Denmark, and Belgium, with 260 megawatts. And China is poised for big development. The government’s goal is 30,000 megawatts of offshore capacity by 2020. This could generate the equivalent of roughly one fifth of China’s current residential electricity consumption. Elsewhere in East Asia, South Korea has big plans for offshore wind, targeting 2,500 megawatts by 2019. The US by contrast is moving only slowly in offshore development. It trails only China in land-based wind generating capacity but has yet to install a single offshore turbine. After a decade of fending off opposition a proposed 470-megawatt project off the coast of Massachusetts aims to begin construction next year, as do two other East Coast projects. A proposed offshore “transmission backbone” of highly efficient underwater high voltage direct current cables financed by Google and other investors would stretch some 300 miles from New York to Virginia, and could connect around 7,000 megawatts of offshore wind to the Mid-Atlantic’s population centres. It’s now under environmental review and complete construction would take approximately 10 years. The National Renewable Energy Laboratory estimates that wind turbines installed in the shallow waters of the Mid-Atlantic region could add up to nearly 300,000 megawatts of capacity—enough to power 90 million U.S. homes. For the entire Atlantic Coast, including deeper waters, the resource is estimated at 1 million megawatts. The EPI report claims that nine of the top ten carbon dioxide emitting countries in 2010 have more than enough offshore wind energy potential to meet all their current electricity needs. (Iran is the exception.) Russia’s offshore wind resources, for example, exceed its current electricity demand by a factor of 23. Canada’s current electricity needs could be met 36 times over with domestic offshore wind energy. It’s clearly an enormous resource, albeit not one that all the countries concerned are racing to exploit. Current leaders in offshore wind are expected to remain the principal sites for deployment, with China, the UK and Germany accounting for more than 70% of new installations. It’s not difficult to see the promise in renewable energy, but it is difficult as yet to see sufficient development to suggest we are serious about decarbonising our economies. It can even seem a little foolish to make much of the promise of renewables, given the political strength of climate change denial and the determination of vested interests to hold on to fossil fuel industries. It’s easier to lament the apparent incapability of the world’s political leadership to challenge the disastrous route we are on than to paint hopeful prospects for clean energy. But there is movement, either with or without government support, and it’s important to publicise that and to say over and over again that we do not need to burn fossil fuels to obtain reliable and abundant power.